The sump pump — it’s supposedly on your team, fighting the battle to remove collected water in the sump basin of the basement of your residence. But what happens to your home when it breaks? Why does it break down? All good questions. 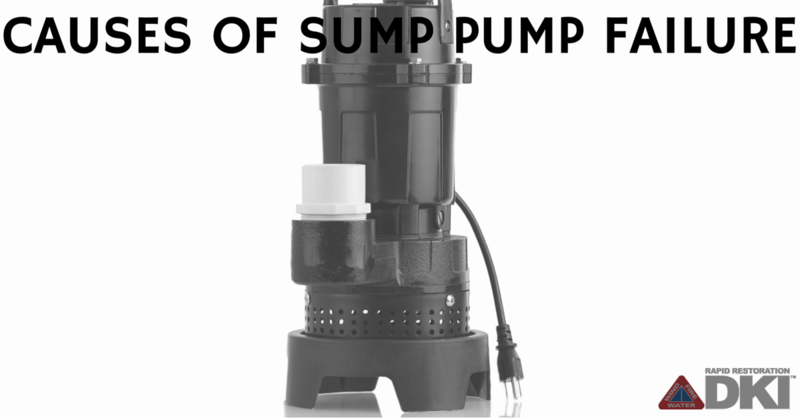 We have gathered some of the more common causes of sump pump failure so you can understand what’s going on. How a sump pump works is pretty simple. A hole dug in the lowest part of your basement or crawl space and that’s where the pump is. As it fills with water, the pump turns on (through electricity) and pushes water out away from the foundation of the home through piping to a storm drain. When the pump fails (and is often submerged in standing water beneath your home), it can leave you with contaminated water or still water that can damage your foundation and carry disease. Sump pump failure can happen for a variety of different reasons. We’ll start with the most common ways and end with the least. The most common reason for sump pump failure is an electrical power outage as a result of bad weather or a storm. You can avoid this by having a backup generator with the ability to be manually activated. An over or under-worked pump will not work efficiency, and will limit it’s lifespan. A pump that is too large will be underworked, while a pump that is too small will be overworked; both result in a shorter lifespan for your pump. Make sure you have the correct size. Click here for a buying guide. If the discharge pipe is frozen, or full of debris, guess where the water goes? Back through the pipe and into your basement, flooding it. Add a protective cover or grate to prevent this from happening. If you basement does flood due to a sump pump failure, call Rapid here. Check valve on discharge line not installed. Without a check valve, you’ll hear the pump running, but it won’t be pumping. Incorrect diameter of discharge line. Most pumps require a small air-relief hole in the line to release pressure from the discharge pipe. Pump is placed in dirt or gravel. Dirt and gravel can enter your pump and cause clogs and damage, or interfere with the float alarm. Sump pumps are great tools, but if used incorrectly or without taking the necessary steps to prevent failure, you could be left with a flooded basement and severe water damage. Don’t worry if this happens, though, our well-educated technicians at Rapid will clean up the mess and get your home back to normal. You can learn more about water damage and what you should do to safely remove the water in our complete guide!